NETWORK FINALS: SPEECHLESS and DATELINE each lost 0.1 in final numbers. CABLE HIGHLIGHTS: Fox Sports 1’s MLB PLAYOFFS game topped Friday cable at 1.13. Discovery’s GOLD RUSH returned at 0.64, with the lead-in hour at 0.29. A&E’s LIVE PD dropped 0.06 to 0.54, and the preceding clip show was down 0.03 to 0.24. ESPN’s COLLEGE FOOTBALL games were at 0.34/0.31. ESPN2’s NBA PRESEASON game was at 0.32. On HBO, REAL TIME WITH BILL MAHER was steady at 0.31, TRACY ULLMAN’S SHOW was at 0.07, and although POD SAVE AMERICA doesn’t appear on the chart because it was inaccurately listed by Nielsen as a rerun, the premiere was at 0.11/454K. HGTV’s MY LOTTERY DREAM HOUSE ticked down to 0.30, HOUSE HUNTERS lost 0.04 to 0.22, and HOUSE HUNTERS INTL was down 0.02 to 0.21. Food Network’s DINERS, DRIVE-INS & DIVES rose 0.07 to 0.26. 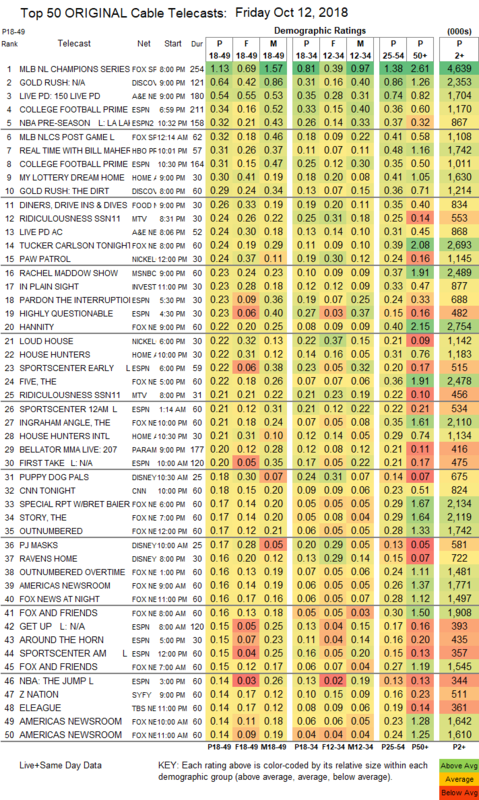 On MTV, RIDICULOUSNESS was at 0.24/0.21, compared to last week’s 0.24/0.19. Fox News’s TUCKER CARLSON TONIGHT led cable news at 0.24/0.39/2.7M, with MSNBC’s RACHEL MADDOW SHOW at 0.23/0.37/2.5M, and CNN TONIGHT at 0.18/0.23/800K. Nickelodeon’s noon PAW PATROL was at 0.24. On ID, IN PLAIN SIGHT was at 0.23, compared to last week’s 0.26/0.22. Paramount’s BELLATOR LIVE was at 0.20. 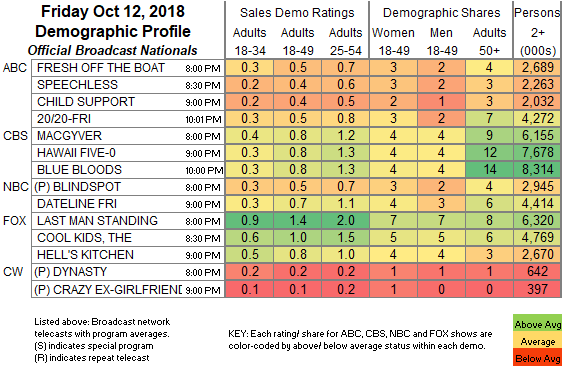 On Syfy, Z NATION fell 0.04 to 0.14, and VAN HELSING was up 0.02 to 0.13. We’s MARRIAGE BOOT CAMP shed 0.02 to 0.13.